Offer Terms: All bonuses awarded as bonus credit.100% deposit match of first deposit, up to £100 and paid as bonus credit with a 1x wagering requirement. Bonus credit cannot be withdrawn. Max withdrawal without depositing is £200. You can withdraw any unspent deposit, in addition to the funds in your cashable credit account, BeGambleAware.org. mFortune first appeared back in 2007, and the brand was one of the first sites around to specialise in mobile gaming with specific on the go apps. The company really paved the way for the types of online bingo apps that we now know and love, and they really did create something innovative that the market had not yet seen. The site was the flagship brand of InTouch games and although they only provided casino and slots titles to begin with, it didn’t take long for them to add some fun and exciting bingo into the mix. The company are based in the West Midlands in the UK, and the brand is licensed and regulated by the UK Gambling Commission. If you’re looking for a great mobile app that offers some basic bingo plus casino games too, then look no further than the mFortune brand. The company are a lot smaller than some of the bigger brands out there at the moment for sure, but this only means that all of their focus is on one specific site. The software and branding is totally independent, and therefore lots of the games available are all completely unique to the network. You’ll find plenty of 90-ball bingo to hand, and the games are very simple and classic in style. There aren’t any other bingo variants available on the site unfortunately, but you will find a nice selection of casino games and slots to play as well. The mFortune site does also exist as a desktop page as well too, so you can choose from either variations to get gaming with the brand. Both the mobile app and the desktop version of the site are super easy to use, and the layout and designs are bright and bold in colour. The company have a huge focus on all of their social media pages too, so if you love to keep up to date with new features and prizes via Facebook and YouTube etc, then you’ll find loads of things to take your fancy in the various mFortune social hubs. The welcome offer at mFortune is really fab. You can find all the details via the link at the top of this page, and terms and eligibility factors will apply. All players must be aged 18 or over. The team at mFortune bingo and casino really pride themselves on keeping ahead of the game with some fantastic daily, weekly and monthly promotions throughout the year. Be sure to check out the mFortune social media pages daily too for some extra treats and surprises along the way. Enter competitions on Facebook and Twitter, with the chance to win some great prizes that aren’t available on the site itself. Get involved with the Game Of The Month Giveaway. Or look out for the Weekly Bingo Prize Draws every Tuesday and Friday at 8:30pm. Both offer some amazing prizes, including free spins and deposit matches. Tickets cost just 10p a game, so don’t miss out and grab a yourself some treats along the way. 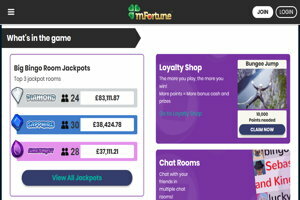 Both the mFortune website and mobile app are powered by the unique InTouch Games software, and the company are based in the West Midlands UK. The choice of Bingo available at mFortune is pretty basic in style, and it’s worth keeping in mind that both desktop and mobile versions of the site only offer 90-ball games. If you prefer a bigger variety of bingo to play, then you may need to register with other sites for different variants like 75 and 80-ball games. There are however 11 different themed rooms to choose from, and each room is based on precious stones such as Diamond, Sapphire, Amethyst and Ruby. The choice of bingo on offer may be limited, however the quality of the gaming is of an excellent standard. It’s the perfect site to visit for some good old fashioned classic 90-ball games, and the tickets range form 10p to 25p a go. The mFortune brand originally started out offering just casino and slots titles to begin with. It was only then due to the popularity of these games and slots that the company eventually decided to add some classic bingo into the mix. You will find 3 casino games rooms to choose from on the site, including Texas Hold’em Poker, Roulette, and 21 Blackjack. The company also boast a massive variety of slots titles too, including popular branded titles plus many in house branded games that won’t be found anywhere else online. It’s super easy to navigate between both the casino and bingo parts of the site and although the mFortune brand are mostly known for the excellent quality of their apps, the desktop and PC version of the site is also really easy to navigate around. There are a fantastic variety of payment options available at mFortune, and all forms of payment are accepted on both the casino and the bingo sections of the platform. Please read all wagering requirements and terms and conditions upon registration to the site as details are always subject to change. It does state on the banking FAQ page too that payments could take as long as up to 12 days to process withdrawals from non-depositing customers. Call Back Support: Text HELP to 85777 to request a free call back from one of the customer service team. The mFortune casino brand is an extremely well established independent company offering an exceptional quality of gaming for on the go use. Although the bingo side of the platform is fairly limited in choice, you will still find a nice choice of 90-ball style bingo with great jackpots and prizes up for grabs. The company do specialise in the app version of the site so that is fairly advanced nowadays, however the desktop version is still maintained well and is definitely kept up to date to a great standard. If you’re looking for a site that offers some classic gaming for when you’re on the move, then why not download the mFortune app and give it a whirl. The bingo is classic, the table games are great, and you’ll also find a few exclusive mFortune slots titles thrown in there too. What Was The First Online Bingo Site? How Does Online Bingo Work? Why Do I Have to Send an ID to an Online Bingo Site? What to Do if you Think you Play Bingo Too Much? What is the History of Bingo? What Is a Progressive Jackpot? What Bingo Games Can I Play Online? Is Online Bingo Legal in the UK? Is Online Bingo a Scam, Fixed or Trustworthy?